The young men did not say a word as the police officers watched them nervously, their eyes fixed on the shotguns. One of the young men held a large law book in his hand�This was the Black Panther Party in ideal action. The real story�the whole story�was both more and less heroic. 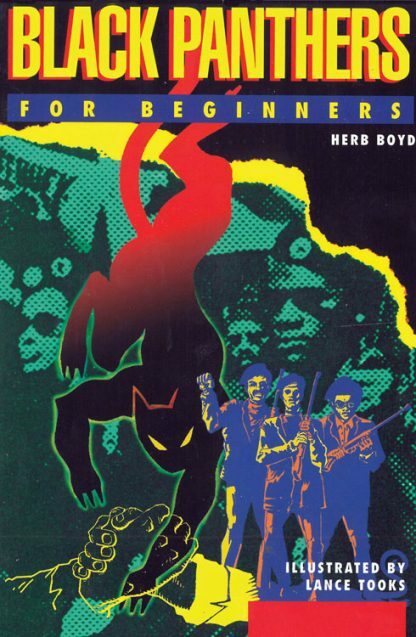 So begins Black Panthers For Beginners. The late 1960s, when the Panthers captured the imagination of the nation�s youth, was a time of regulation. While their furious passage was marked by death, destruction and government sabotage, the Panthers left an instructive legacy for anyone who dares to challenge the system. Herb Boyd has done exhaustive research, examined the claims of all parties involved, and boiled the story down to �the truth.� We believe this is the most truthful book on the market, but each Panther has his or her own story to tell. We suggest that you check out the stories of all the Black Panthers. Lance Tooks�s artwork has appeared in commercials, films, and music videos. He self-published the comic books Danger Funnies with Cry For Dawn, and contributed the Graphic Classics books, adapting the works of Edgar Allan Poe and others.